When I was a kid I rode horses and was an avid ocean swimmer, and I absolutely fell in love with all sea creatures. But there was a special place in my heart for the one that seemingly combined my land and sea passions, the seahorse. Come to think of it, I don’t think I actually thought these undersea chimeras existed in real life…in my mind they lived in storybook land along with unicorns and Mr. Tumnus. I mean, I never saw a real one…so how could I know? But these days kids are getting familiar with the real deal thanks to the hard work of a handful of public aquariums, like the Monterey Bay Aquarium, The Steinhart Aquarium, The National Aquarium in Baltimore, The Shedd Aquarium, and The Birch Aquarium among others. Seahorses are sold as expensive ingredients used in traditional Chinese medicine. Not surprisingly, I jumped at the chance to produce the Quest “Seahorse Sleuth” story, but I will admit that the process of making this piece was demoralizing, to say the least. I spent days in San Francisco’s Chinatown trying to get shop owners who sell Traditional Chinese Medicine (TCM) to talk to me about their trade, and specifically about seahorses. I must have visited 20 or so stores, multiple times, and I saw many hundreds of dried seahorses and thousands of shark fins, not to mention enormous piles of antlers, skins, penises, and whole dried animals. Though I tried many different approaches, no one would talk to me…I was clearly an outsider and not to be trusted. (Had I managed to garner the trust of one of the shop owners, I would have certainly included them in the piece). This experience made me even more impressed and appreciative of the hard work that the folks at Project Seahorse are doing, and exhausted at the thought of how far they still have to go to convince fisherman and governments around the world not to decimate their seahorse populations. But whereas Project Seahorse must be measured and careful in their approach to these conversations about TCM in order to make headway, I feel that in this blog I can be more forthcoming about my feelings about the use of these animals, and all animals, in TCM. Of course TCM has a rich history dating back at least 2,000 years, and at least a quarter of the world’s population uses this form of medicine. I myself find acupuncture and herbal remedies to be very helpful and do not wish to debunk the efficacy of at least those two parts of the tradition. But I personally draw the line at the use of animals, because I’m a huge animal lover, and I am absolutely appalled at the use of endangered or threatened species for any use. This planet may have seemed endlessly bountiful 2000 years ago, but today we can no longer afford to take the survival of non-human species for granted. To add salt to the wound, it is my understanding that China does not, as of yet, perform the kind of rigorous testing of these products that we must perform for drugs in the U.S. to determine their effectiveness. (This is why we get products from China with arsenic in them, for example). 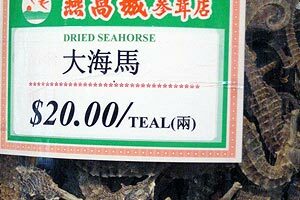 One of the main uses of dried seahorses (and many other dried animals) in TCM is for male virility, though I do not believe there have been any studies that actually prove it has any effect on virility. I don’t know about you, but I think it’s dumbfounding that a country with an official one-child policy, which has led to female infanticide levels that have caused a significant gender imbalance in China, thinks they need to ingest threatened and endangered species to improve the potency of their male population. Let’s put the pieces together here folks. Ok, I’m going to get off my soapbox now, since I’m getting into territory that I am certainly not an expert in. But I did want to present this topic for open discussion – since that’s what blogs are for. But before you get too riled up, let me suggest a few websites for further research. First of all, learn what you can do to help save seahorses by signing on to the Monterey Bay Aquarium’s Seahorse Conservation Page. You can also brush up on the specific uses of Endangered Animals in Traditional Chinese Medicine with this informative paper on Encyclopedia’s “Advocacy for Animals” site. TRAFFIC (The Wildlife Trade Monitoring Network) has a new Chinese-language textbook aimed at raising awareness on how to best protect threatened species used in TCM. Lastly, check out The World Wildlife Fund’s FAQ page on Traditional Chinese Medicine. And that’s just to get you started…the web has plenty of information on this topic…read it and tell your friends! Compelling and engaging story. I had known nothing about seahorses prior to seeing this piece, and now have a new appreciation for the endangered species. Seeing the hundreds if not thousands of dried seahaorses in those stores was gut-wrenching. Thank you for bringing this story to light. Thanks so much for your note, that’s exactly what I aimed to do…bring the story to light. And don’t forget to tell your friends about the seahorses! Excellent job revealing the beauty of these enigmatic animals and the threats they face. It was a real pleasure helping with this program. Such interesting creatures. So fun, so lively, why do we have to kill them off. I was shocked to see so many of them dried out, lifeless, once so full of live, killed for what ?Our egos are just too big, and cannot include in our circle species we hunt till they are exterminated. This makes me mad and sad.